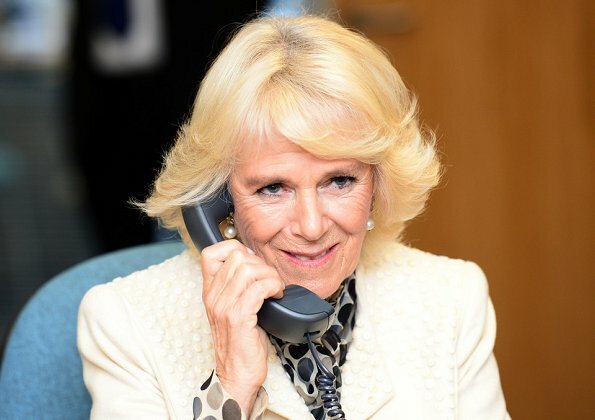 On December 8, 2017, Camilla, Duchess of Cornwall visited The Silver Line office, a helpline for elderly people in Blackpool, England. The Silver Line is the only free confidential telephone helpline offering information, friendship and advice to older people in the UK that's available 24 hours a day. The helpline was established by Dame Esther Rantzen. 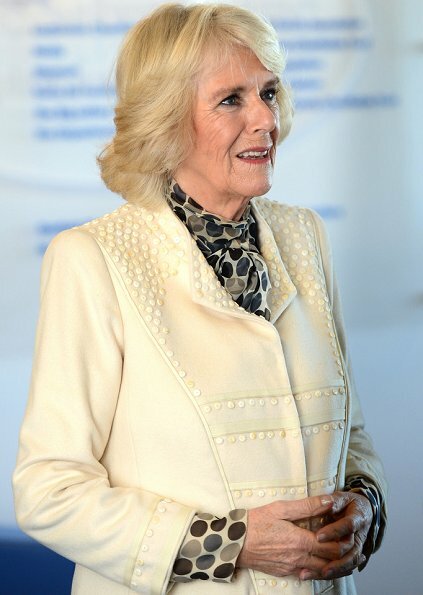 The Duchess of Cornwall is the patron of The Silver Line. Not a great color for our Camilla! I never noticed how she has aged... does skin treatment do this to you? Not skin treatment, but years of sun and smoking. She has given up smoking, but not the sun. I don't think she's a sun worshipper like the Monaco princesses but she's definitely lead a very outdoors life - and even in the UK that will show on your skin. But then she's also 70 so just a natural part of aging as well, I think. It's the lack of facial tratments that makes this to a face, and smoking and sun are also the skin's enemies. With quality facial tratments you can look like Susan Sarandon or Helen Mirren do, and both ladies are the same age as Camilla. Of course everyone is quite entitled to decide if she/he wants to use those tratments. If she/he can afford them, that is. Aparently Camilla doesn't see the need for beautification or for good, custom made foundation garments. Both actresses you mention look great but Susan Sarandon has had plastic surgery and I doubt Helen Mirren has spent as much time out of doors as Camilla. But you're right, I doubt Camilla spends huge amount of time having facials etc. But then, I don't think she looks that terrible - I've never understood why a natural process and someone being comfortable enough to accept it is such a problem. Of course she doesn't look terrible, but she could look very good if she put a little more effort in her skin's care. She has beautiful, sparkly eyes and a good mane of hair and both these assets would be enhanced if the wrinkles around her mouth were reduced. Regarding her figure, well designed and well fitted intimate apparel can do wonders for it. 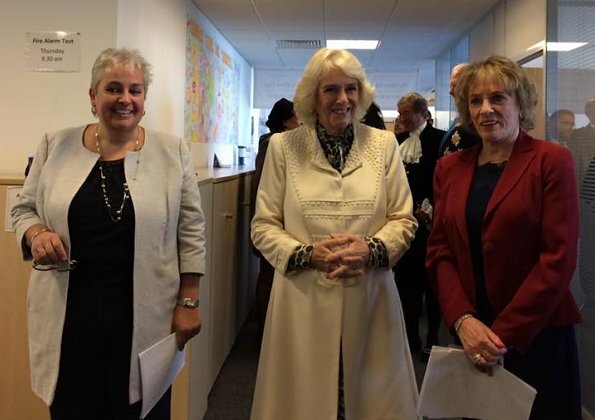 Small point: I recently learned, through the blog Royal Musings I think, that 'Camilla, Duchess of Cornwall' would be the wrong designation here. That would mean that Camilla was divorced from Charles, which is not the case. (Eg. Sarah, Duchess of York) The proper name here is 'The Duchess of Cornwall'. Otherwise, great blog! 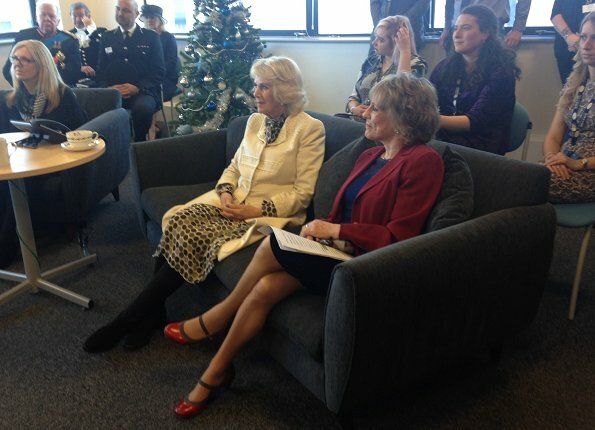 Could also be Camilla, the Duchess of Cornwall. Who cares, everyone know what the author means. This is splitting hairs. Camillas dresses/clothes are always very well-fitted …… I think most are tailored, no on-line buy or much from a 'ready-to-wear' collection (prêt-à- porter). She looks great - I always admire people brave enough to wear white or cream coats, I would get it dirty within a minute!